Dr Andrew Swayne is neurologist, Queensland Health Junior Doctor Research Fellow and Betty McGrath Research Fellow working out of the Mater Centre for Neurosciences. 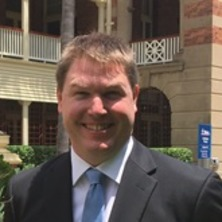 Prior to coming to the Mater, Andrew completed his postgraduate medical degree with first class honours at The University of Queensland where he was co-dux of his year. Also holding an honours degree in law and a science degree with majors in neurobiology and genetics, Andrew maintains an interest in media, literature and communication having, during his undergraduate years, edited The University of Queensland student newspaper – Semper Floreat. Andrew's research interests centre on utilising novel techniques such as advanced imaging and multimodal approaches to better characterise autoimmunity affecting the nervous system. He maintains clinical and research interests in neuroimmunology including multiple sclerosis and autoimmune encephalitis. Andrew's clinical practice also incoporates general neurology neurology including stroke and other disroders. Warren, N., Swayne, A. and Blum, S. (2018). Psychiatric presentations of autoimmune encephalitis. In: RANZCP 2018: Book of Abstracts. RANZCP 2018 Congress, Auckland, New Zealand, (121-122). 13 – 17 May 2018.